First teased back in June of last year, we got our first official photos of some of the new Playmobil Ghostbusters sets a little later in the year in October. But as the toys move closer to finally being available come May of this year, Playmobil is revealing all of the details at the Nuremberg International Toy Fair that gets underway starting on Wednesday. But why wait another 24 hours when we’ve got everything you need to know right now? Arguably one of the most iconic vehicles in movie history, you can’t have a Ghostbusters toy line without a tiny version of Ecto-1. 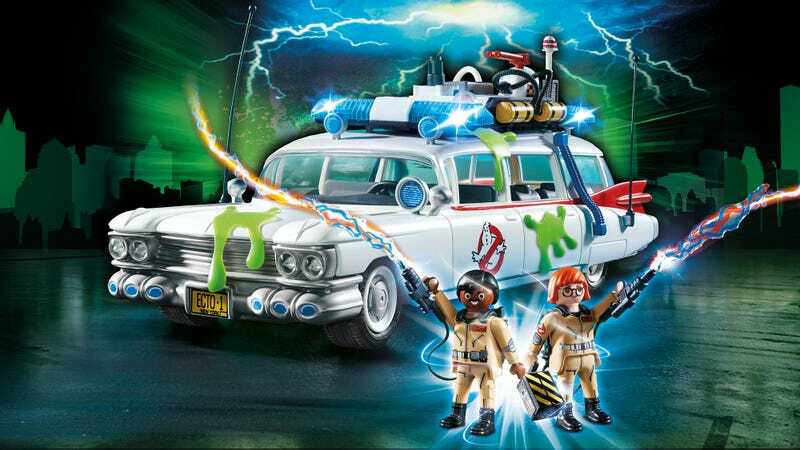 The Playmobil version features working lights and movie-authentic sound effects (powered by a trio of AAA batteries), a removable roof allowing figures to be placed inside, and silicon slime splatters that can be stuck all over the vehicle. The $45 Ecto-1 playset also includes Playmobil versions of Winston Zeddemore and Janine Melnitz (wearing her own Ghostbusters uniform! ), who are equipped with tiny proton packs, traps, and PKE meters. The largest set in Playmobil’s new line is the Ghostbusters Firehouse that stands 18 inches tall with a garage large enough for Ecto-1 to park inside. The $70 firehouse comes with Playmobil versions of Raymond Stantz, Louis Tully, Egon Spengler, and an office version of Janine Melnitz, in addition to assorted spirits that can be locked away in the Ghost Containment Unit you do not want to shut down. It’s even got a miniature fire pole that the Playmobil figures can use to quickly slide down to the garage. It’s not easy to steal the spotlight away from Bill Murray, but the adorable Stay Puft Marshmallow Man did just that as he thrashed his way through New York City in the original film’s finale. Playmobil’s $20 version of the Stay Puft Marshmallow Man isn’t quite as massive, but at almost eight inches tall he still towers over the included Raymond Stantz figure (“I tried to think of the most harmless thing. Something I loved from my childhood. Something that could never ever possibly destroy us...”) who also comes with a proton pack and a pair of Ecto-Goggles which probably aren’t needed to see this threat coming. The real appeal of this $18 hot dog stand playset isn’t the miniature version of the always-hungry Slimer ghost who can stuff his face with tiny snack accessories like hot dogs, hamburgers, condiments, and drinks. It’s instead the included surly Playmobil New York hot dog vendor with a perpetual five o’clock shadow who seems to be happily threatening the attacking apparition with a pair of hot dog tongs. He should come with every set Playmobil sells. The best part about Playmobil licensing the Ghostbusters brand is that you can finally buy a Playmobil version of Bill Murray, dressed as one of his most memorable characters. And as a bonus, the $13 Peter Venkman figure also comes with a Dana Barrett-possessed-by-Zuul figure, and a pair of the creepiest dogs, complete with glowing red eyes, you’ve ever seen. As one of the brains behind the Ghostbusters operation, Egon Spengler helped make being nerdy actually seem kind of cool. And in this $8 set he shows off more than just his smarts by battling two glow-in-the-dark ghosts at the same time using his included proton pack and ghost trap. If all you’re after is the actual Ghostbusters figures, it looks like you’re going to have to buy quite a few Playmobil sets to assemble the whole team. Going that route isn’t great for your wallet, but it’s all the excuse most of us need to basically buy everything in this new line.